To wrap up their 2010 read aloud year, Amy at Hope is in the Word is listing some of their favorite chapter books that they conquered in the House of Hope. It's a great post and I heartily recommend it. Amy does a great job reading chapter books aloud with her children and it was she who inspired me to try reading some of the same with Bookworm1. Being three this year (and then turning four), I can't say that Bookworm1 is a great fan of chapter books. It's definitely a stretch for him but we've added incentives for completing a chapter book just to get the ball rolling. (Incentives are sometimes the only motivator, as was the case with The Mouse and the Motorcycle.) Only one book required zero motivation and I'm betting you can guess which one that is based on how many times I've raved about it this year! We also started reading The Twenty-One Balloons after Amy mentioned it. I thought Bookworm1 might like it with mentions of volcanoes and sharks but I think it's a bit above his head just yet so I'll finish it myself. I'm on the prowl for another Tumtum & Nutmeg thriller but I think I'm going to have to pass the hat to daddy for the next read aloud - Freddy Goes to Florida. 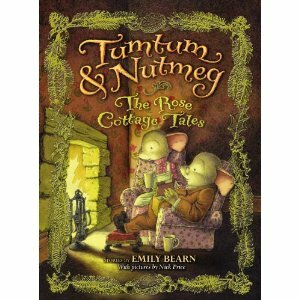 In the meantime, we finished Tumtum & Nutmeg: The Rose Cottage Tales about mid-December. This one took us awhile longer to complete. Granted, he was still excited about reading it, but his attention span waned in the middle of the third and final story and so we drug our feet along to the very end. The day Tumtum & Nutmeg: The Rose Cottage Tales arrived in our mailbox, Daddy said he'd take the boys out to run some errands. But no. Bookworm1 voted to stay home and read TUMTUM & NUTMEG! (Be still my reading mother's heart!) We devoured the first story in this edition, A Christmas Adventure, that very same evening. We read it straight through - all ten chapters. I was thinking I'd have the book read and ready to review by the end of the week but we slowed down our tempo considerably after that. I won't say much about this book. Suffice it to say I think it's just about as wonderful as the first. A Christmas Adventure definitely takes the cake, involving Baron Toymouse who stingily and greedily occupies the nursery of an abandoned home, keeping all the toys therein for himself. Tumtum and Nutmeg purpose a friendly visit but the Baron isn't interested in having company. It's a very cute Christmas story and we both enjoyed it. Cute mice. Again - how can you go wrong? We still heartily and highly recommend Tumtum & Nutmeg as literary friends. We're glad that they are ours. Of course, these chapter books are not the only books we've read aloud. We've read a plethora of picture books, a great many of which I discussed over at Reading My Library. We're always reading which is something I'm very grateful for. Come next year most of my Read Aloud Thursday posts will be over at Reading My Library, the exception being if we make it through a chapter book. In that case, I'll discuss it here. Thanks, Amy, for encouraging us to delve into stories with our children. I love your motivation and your heart for reading! Mostly - I love your heart for your family and how that manifests itself at Hope is in the Word. Thanks for hosting this regular weekly reading meme/challenge. I look forward to participating consistently again in 2011! My girls got the new Tumtum & Nutmeg for Christmas, and I am eager to get started on it! Looking forward to more RATs in the new year!